FSMIS (September 30, 2014): In response to communication from the Federated States of Micronesia Vice President Alik L. Alik, the FSM Congress quickly summoned the Secretary of the Department of Finance and Administration, the Secretary of Justice, the Customs and Tax Administration Division, and the Tax Reform Program for a hearing at noon today. Vice President Alik also showed up at the meeting. The meeting was chaired by Senator Wesley Simina, the Vice Chairman of the Committee on Ways and Means, and was open to all Members. Senator Simina stated the meeting is initiated in reaction to information received during today's session regarding the decision to start transitioning the administration of tax from the current CTA Office to the Unified Revenue Administration (URA). Some Members indicated that they felt the URA, as a component of the tax reform program, could not be implemented given that the Revenue Administration Act's "sunset clause" went into effect last May. Besides expressing concerns on legal matters, Congress expressed disagreement that the Executive Branch is preparing to proceed with the implementation of the URA without all the State governments' involvement in the operation. The collective response from the Executive side was that the basis of the decision to proceed is to fulfill their roles derived from the Unified Revenue Authority Act of 2010 itself, which Congress enacted four years ago. Some Members also wondered if implementing the URA will discourage the States of Pohnpei and Yap from coming on-board with the tax regime reforms. Vice President Alik did not view the decision to implement the act as a way of alienating the remaining two States from the tax reform endeavor. He said he remained hopeful that National and State Leaderships will be committed to modernizing tax regime for all governments in the federation. The URA will begin assuming its role on October 1, 2014 (tomorrow) in a transition period of three months involving the tax administration offices for the National Government, Chuuk State and Kosrae State. It is expected to become fully operational by January 2015. Along with Chairman Simina, Congress Members who participated at the meeting were Vice Speaker Paliknoa T. Welly, Floor Leaders Singkoro Harper, Senator Joseph J. Urusemal, Senator Yosiwo George, and Senator Berney Martin. (September 26, 2014): Federated States of Micronesia (FSM) President Manny Mori attended a meeting held between the United Nations Secretary-General Ban Ki-moon and Leaders of the Pacific Islands Forum at the margins of the 69th session of the UN General Assembly in New York. The meeting was co-chaired by the UN Secretary-General and the President of Palau, Mr. Tommy Remengesau Jr., who is the current Chair of the Forum. The Secretary-General recalled his recent visit to the region and his participation in the Third Conference on Small Island Developing States (SIDS) in Apia, Samoa. Pacific Leaders and the Secretary-General stressed the importance of the implementation of the Samoa PATHWAY. The Secretary-General reassured the Forum Leaders that the UN system would work as one to engage in the implementation of the commitments made during the SIDS conference. Pacific Leaders commended the UN Secretary General on his leadership on climate change issues and the recently concluded Climate Summit. They agreed to the importance of fully capitalizing the Green Climate Fund. Leaders reaffirmed their support to conclude a legally binding climate agreement next year. Leaders sought support to enable the continued active engagement of Pacific negotiators in the upcoming Conference of the Parties (COP) of the UN Framework Convention on Climate Change to be held in Lima and Paris. They also discussed the achievement of the Millennium Development Goals and the post-2015 development agenda. The UN General Assembly’s adoption of the report of the Open Working Group on Sustainable Development Goals was welcomed. Pacific countries appreciated the stand-alone goal on oceans and sea as well as the goals related to sustainable development and climate change. The Secretary-General took note of the Pacific Leaders Gender Equality Declaration and the Pacific Regional Action Plan on Women, Peace and Security and encouraged leaders to strengthen efforts to improve women’s political participation and economic empowerment and to eliminate violence against women. The President of Palau concluded the meeting by stressing that the Pacific countries would continue to think of the United Nations as a critical partner to move their agenda forward. The meeting between the Pacific Islands Forum Leaders and the UN Secretary General and his key staff has become a tradition at the margins of the General Assembly Leaders’ week. 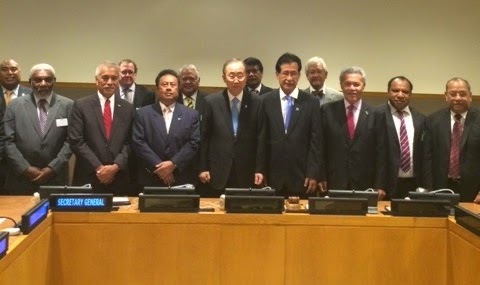 (September 25, 2014) The first Japan-Pacific Islands Leaders Meeting was held today at the margins of the 69th UNGA. The meeting was convened by Prime Minister Shinzo Abe to discuss issues of mutual interest to the Pacific and Japan under the umbrella of the PALM. Pacific Leaders thanked Prime Minister Abe for the timely opportunity to exchange views. The meeting was held following the convening of the UN Secretary General’s Climate Summit and as such, Pacific Leaders raised climate change and its adverse impacts on their peoples’ livelihood; social and economic development sectors such as fisheries, food and water security; the unfinished business of the millennium development goals, the Sustainable Development Goals and the post 2015 development agenda, the SAMOA Pathway, a reformed UN to be reflective of the times, Means of Implementation, among others. FSM President Manny Mori took the opportunity to seek the support of Japan for FSM’s proposed amendment to the Montreal Protocol. The proposed amendment to the Protocol, which has become one of the President’s pre-occupation during his term in office, will constrain the growth of HFCs as an initiative to close the pre-2020 emissions gap. President Mori also sought Japan’s support towards the full capitalization of the Green Climate Fund (GCF). In his brief intervention during the exchange of views, President Mori assured the Japanese leader of FSM’s support for Japan’s candidature for the non-permanent seat of the Security Council for the period 2016-17. While Japan is running unopposed from the Asia-Pacific Group, it still needs a two-third of the votes to realize its goal. Prime Minister Abe expressed his government’s support of the issues raised by the Pacific Leaders and assured them that they will be further discussed in PALM 7 in May 2015. He also sought the support of the Pacific for their candidature for the non-permanent seat of the Security Council for the period 2016-17. 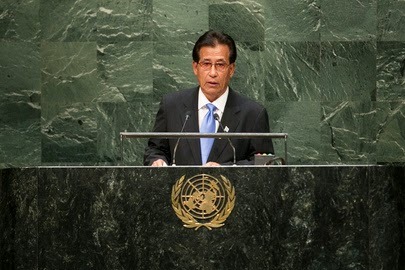 (New York, September 26, 2014): President Emanuel Mori addressed the 69th United Nations General Assembly Friday afternoon, referencing recent world events and raising issues of importance to Micronesia and other small island developing States. In particular, he focused on the theme of climate change and again highlighted Micronesia’s proposal to the Montreal Protocol to phase down the greenhouse gases HFCs. The President first extended his sympathies to the families of the victims of recent tragedies, including the passengers on Malaysian Airlines Flight 17, those beheaded by ISIS and victims of the Ebola epidemic and of natural disasters worldwide. He called on major polluters to rise to the challenge and tackle climate change, and, in this regard, he expressed support for the World Bank carbon pricing initiative. He also applauded recent pledges to the Green Climate Fund, capitalization of which will be key to supporting the post-2015 development agenda. President Mori underscored the importance of adopting an amendment to the Montreal Protocol to phase down HFCs, which Micronesia has championed for five years. He explained that reducing HFCs and other short-lived climate pollutants can reduce the rate of sea-level rise by 25%, and he pointed out that this near-term climate mitigation would give atolls around the globe a chance of survival. He drew attention to two articles in the most recent issue of The Economist magazine, which validate Micronesia’s HFC proposal and describe the enormous potential of the Montreal Protocol to protect climate. A portion of the President’s statement was dedicated to national action, including the National Energy Policy, the Climate Change Act, the Nation Wide Integrated Disaster Risk Management and Climate Change Policy, and the Agriculture Policy. The President called on development partners to continue to support Micronesia through these existing policies and programs. He stressed the critical importance of assistance to implement the actions outlined in the SAMOA Pathway and to fulfill the prospective Sustainable Development Goals. He also endorsed the “One-UN Approach” for country-level attention in the North Pacific. He cited telecommunications as a key area for economic and social development, noting with appreciation the support of the World Bank to install a state-of-the-art fiber optics system. The President denounced Illegal, Unreported and Unregulated (IUU) Fishing and wasteful discarding of bycatch. With respect to tuna and other marine resources, he said that Micronesia must receive fair compensation for the value of its resources. He also addressed the issues of non-communicable diseases in the Pacific and the despicable practice of human trafficking. FSMIS (September 28, 2014): On September 24, 2014, the Federated States of Micronesia Eighteenth Congress approved a grant in the amount of $5,000,000 from the United States Federal Aviation Administration (FAA), extended to Chuuk State for airport rehabilitation and relocation of the airfield electrical vault. This grant is to fund the second phase of the Chuuk International Airport rehabilitation project. Section 210 (2) of Title 55 of the Code of the FSM provides that for an agreement of foreign financial assistance to be valid, it must be approved by resolution of Congress. Senatore Wesley Simina, commenting after the adoption of the grant, said the FSM National Government had also provided $125,000 for repair work on the terminal building, which he felt was vitally needed for Chuuk. Airport improvements in the FSM States have been done under grant assistances accepted by the National Government. From left: Mr. Sitan, FSM R&D Secretary Henry and FSM Finance and Administration Secretary Ikosia during formal handing over of payment from NFC to FSM Finance. FSMIS (September 27, 2014): On September 26, 2014, Mr. Kensley Ikosia, Secretary of the Federated States of Micronesia Department of Finance and Administration, formally accepted a check of $250,000 from Mr. Peter Sitan, Executive Director of the FSM National Fisheries Corporation. In a letter of September 25th, Mr. Marion Henry, Chairman of the NFC Board of Directors, indicates that the money is a fifty-percent payment for an Air Freight loan extended to NFC by the FSM National Government in 1997. "This is the first payment ever made by the Corporation which made the Board and Management very proud of this achievement. We hope to pay off the a lance of the air freight loan within the next 12-20 months." The formal handing over of the check was done at Secretary Ikosia's office in Palikir. New York, 21 Sept 2014 -- While in New York for the 69th session of the UN General Assembly, President Emanuel Mori took the time to join hiscolleague Presidents, Thomas Remengesau Jr of Palau and President Christopher Loeak of the Marshall Islands, in a ceremony jointly hosted by the Israeli government and the American Jewish Committee (AJC) honoring the three Presidents. The hosts of the event, held at the impressive DonaldTrump Building overlooking the UN Headquarters, also took the opportunity to express appreciation to the three Micronesian nations for their staunch support of Israel at the UN and other international fora. The Israeli government was represented by its Permanent Representative to the UN, Ambassador Ron Prosor, and the AJC by its US National Chapter President Stanley Bergman. Also present was Ambassador Peter Rosenblatt, who was President Carter’s top negotiator during the negotiations for the future political status of the former Trust Territory of the Pacific Islands that culminated in the Compact of Free Association. It has become a tradition for the officers of the AJC, which has had dispatched humanitarian assistance to the FSM, to meet with the FSM head of delegation at the margins of the annual UNGA. In their appreciation remarks, Prosor and Bergman highlighted both the “courage and conviction” by which the three Micronesian nations deployed their respective votes at the UN in support of Israel. AJC Executive Director David Harris also expressed appreciation to the Micronesian leaders for following their “conscience” and “moral compass” in supporting Israel. In his remarks, President Mori referred to the “special affinities” between the Micronesian and Israeli peoples, derived in large measure by their shared Judeo-Christian values and traditions, reminding that the Micronesians had come to know Israel as the Holy Land long before the consummation of formal relations between the two countries on 23 November 1988. The President also noted with appreciation that Israel was the very first country in the large region of the Middle East, Africa, and Europe that extended diplomatic recognition to the FSM at uncertain time when the FSM first step unto the world stage as an independent state seeking expanded diplomatic recognition. Another common denominator between the FSM and Israel that President Mori noted in his statement is the special relationship that both countries, each in its own way, have with the United States. This common denominator also offers an area of common cooperation between the three countries in what has been referred to as Triangular Partnership. President Mori was joined at the commendation ceremony by First Lady Emma Nelson-Mori, Secretary of Foreign Affairs Lorin S Robert, FSM Permanent Representative to the UN Jane J Chigiyal, FSM Ambassador to the US Asterio R Takesy, OEEM Director Andrew R Yatilman, Deputy Permanent Representative Jeem S Lippwe, and Deputy Chief of Mission James A Naich. The next day, a delegation from the World Jewish Congress led by Secretary-General Emeritus Michael Snyder and Rabbi Joel Meyers, paid call on President Mori to also convey appreciation for the support that the FSM has consistently and unhesitatingly given to the State of Israel and the Jewish people around the globe. The WJC is an umbrella organization of approximately 1000 Jewish groups in about 100 countries. While this was the first interface with WJC representatives, Rabbi Meyers said “we have gotten to know your country for its courageous support for Israel, which we appreciate deeply. 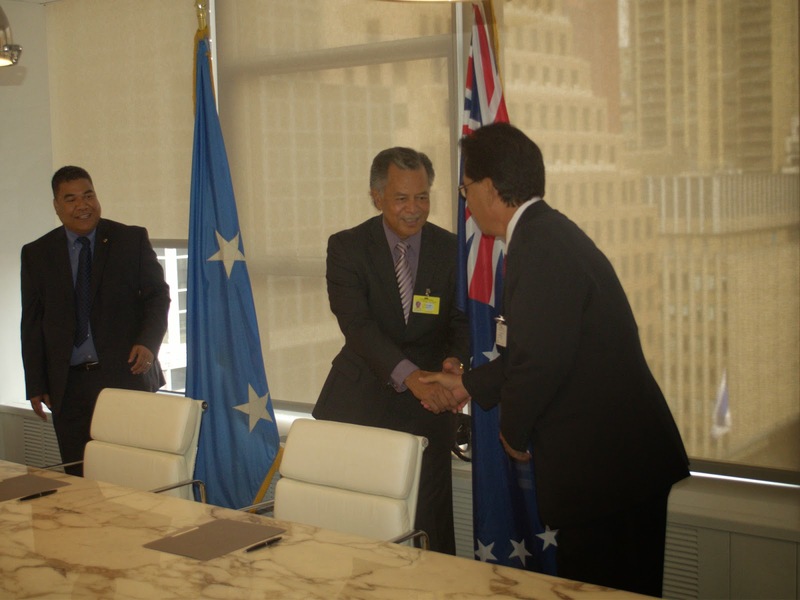 September 24, 2014 (New York) – The Federated States of Micronesia and the Cook Islands today signed a joint communiqué for the establishment of diplomatic relations between the two countries. The signing ceremony, which took place at the Permanent Mission of Micronesia to the United Nations in New York, was officiated by the Federated States of Micronesia President Emanuel ‘Manny’ Mori and the Prime Minister of the Cook Islands, Hon. Henry Puna. In the ensuing discussions after the ceremony, the two leaders expressed their readiness to develop mutually beneficial bilateral relations in the political and economic areas and to address climate change and other high priorities of Pacific islands countries. The Cook Islands becomes the sixty-ninth country with which the FSM has established diplomatic relations. The meeting was attended by the Secretary of Foreign Affairs, Mr. Lorin Robert, Ambassadors Ms. Jane Chigiyal and Mr. Asterio Takesy as well as Mission and Embassy staff. Deputy Permanent Representative, Mr. Jeem Lippwe acted as witness. Ms. Dallas Young witnessed for Cook Islands. FSMIS (September 24, 2014): The FSM Program Management Unit (PMU) Office, responsible for overseeing the implementation of infrastructure development projects pertinent to the Compact of Free Association between the FSM and the United States, came out with a recent update on the status of the Weno road project, in response to inquiries from the Public Information Office. The road project was put on hold almost a year ago after the PMU decided to terminate construction contract with the Pacific International Inc. (PII) on November 7, 2013. In his September 23rd email message, Mr. Bruce Howell from the PMU states that the construction contract for the continuation of the project "has gone through a number of revisions" when reviewed by the FSM Department of Justice (DOJ). "We received the final version with DOJ signature yesterday (September 22nd). The contract is in finance now awaiting assignment of a contract number. Once this is complete, I will send to GPPC for signature. I hope we can do this today or tomorrow. Once GPPC signs they will have 10 days to provide their performance and payment bonds and insurance certificates. Once we receive these, the PMU will issue a written notice to proceed. The contract performance period will commence 10 days from the date of the notice to proceed." Mr. Howell goes on to indicate that, "If GPPC signs tomorrow they have until Oct 5 to submit bonds. Say PMU issues notice to proceed by Oct 7th. Contract period starts on Oct 17th. GPPC should start their mobilization almost immediately. By mid November they should be doing productive work on the ground". The PMU awarded the completion of the Weno road project to the Saipan-based contractor, GPPC, Inc., on April 9, 2014. FSMIS (September 22, 2014): Mrs. Changeina Masang, Chuukese by birth, married and residing in Palau for several years, has been appointed the Honorary Consul of the Federated States of Micronesia in the Republic of Palau by President Manny Mori. President Mori made the appointment on September 18th pursuant to Article X of the FSM Constitution and Title 10 of the Code of the FSM and in accordance with Chapter 3 of the Vienna Convention on Consular Relations of 1963, as stated in the commissioning document. President Mori' appointment requires acknowledgement and giving of credence by the President of the Republic of Palau in order for Mrs. Masang to be able to carry out the duties and functions of her appointed office. FSMIS (September 22, 2014): Federated States of Micronesia Vice President Alik L. Alik provided Congress information on the approved Supplemental Education Grant for the FSM National Department of Education, the College of Micronesia-FSM, and the education departments for the States of Chuuk, Pohnpei, Yap and Kosrae for the period of October 1, 2014 to September 30, 2015. The availability of the “Notification of Grant Award” document was indicated through a September 10, 2014, communication to FSM Ambassador to the United States, Mr. Asterio Takesy, from Mr. Nikolao I. Pula, Diretor, Office of Insular Affairs, United States Department of the Interior. Enclosed with the communication was the notification document itself. FSMIS (September 22, 2014): On September 11, 2014, Federated States of Micronesia President Manny Mori appointed Associate Justice Ready Johnny as Acting Chief Justice of the Supreme Court of the Federated States of Micronesia. President Mori wrote to Justice Johnny, " In view of the vacancy in the office of the Chief Justice of the FSM Supreme Court, the President has the constitutional duty to appoint an associate justice of the Supreme Court to perform the duties of the office pending the appointment of a chief justice". He went on to say, "Therefore, pursuant to the authority vested in me as the President of the FSM under Article XI Section 4 of the FSM Constitution, you are hereby appointed as Acting Chief Justice of the Supreme Court of the Federated States of Micronesia until the court vacancy is filled". The vacancy came about when the late Chief Justice Martin G. Yinug passed away on August 31st in Yap State, leaving the Supreme Court with only two other Justices -- Associate Justice Johnny and Associate Justice Beauleen Carl Worswick. According to Mr. Kohsak Keller on September 22nd, Chief Clerk of the FSM Supreme Court, Acting Chief Justice Johnny will continue to be based in Chuuk State. The Supreme Court will coordinate between the main Office in Palikir and the Chuuk Office on matters that require ACJ Johnny's attention. For inquiry, contact the FSM Supreme Court Palikir Office at 320-2357 or email fsmpio@mail.fm.